Akerson: Looking for cost cuts. DETROIT (Bloomberg) -- General Motors Co. CEO Dan Akerson is pushing for more cost reductions to send a message to the automaker's employees: GM's $6.3 billion first-half profit, its best in at least 20 years, isn't good enough. Chief Financial Officer Dan Ammann made several presentations in recent months to explain that more cuts are needed because GM's 6 percent margins -- calculated by Morgan Stanley Investment Banking using earnings before interest and taxes -- lead only tsunami-stricken Toyota Motor Corp. and French carmakers Renault SA and PSA Peugeot Citroen. GM, poised to take back the global sales crown, wants to beat Ford Motor Co.'s and Volkswagen AG's 7 percent margins, said Jim Cain, a spokesman. Ammann and Akerson are scrutinizing product programs, squeezing marketing spending and trying to consolidate the family of engine and vehicle platforms used to make cars. GM is even turning down thermostats in some offices. "Ford's North American margins are easily two percentage points better than GM's," Adam Jonas, an auto-industry analyst at Morgan Stanley, said in a telephone interview. "We think that gap can narrow." In the first half of the year, GM posted an operating margin of 5 percent compared with 7.5 percent for Ford and 7.8 percent for Volkswagen, according to information compiled by Bloomberg. GM's third-quarter earnings, which will be announced tomorrow, will show if the company is making progress. Four analysts surveyed by Bloomberg predicted, on average, that GM's third-quarter net income would fall to $1.6 billion, down from $2.16 billion a year earlier. Higher prices for commodities as well as engineering and marketing costs have eroded profits this year. In the fourth quarter, Jonas expects GM's earnings to fall in North America. Inventories rose from 67 days worth of vehicles in September to 82 days in October. That may result in higher incentives or production cuts during the quarter, Jonas said. GM has scoured for cost cuts ever since expenses rose in the first quarter. 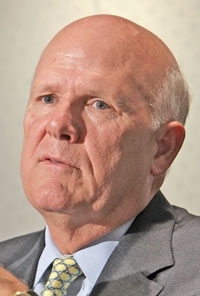 Akerson said on May 5, when GM reported first-quarter results, that he wanted to make cost control a priority. GM said rising costs for engineering and marketing cut first-quarter profits by $700 million. Operating costs rose by another $300 million in the second quarter, Jonas said. One target is reducing the number of architectures that form the basic foundation of GM vehicles. The company wants to pare its architectures to 14 by 2018 from 30 now by building more high-volume vehicles using the same architecture, Mary Barra, the company's senior vice president for global product development, said in a phone interview. In 2010, 31 percent of GM's sales came from vehicles built on a handful of core architectures such as compact and mid-size cars, GM said at an investor presentation in August. Ford gets more than 70 percent of sales from its core architectures, Jonas said. With the Chevrolet Cruze compact now on sale, GM's sales from core-architecture vehicles is in the mid-40 percent range, Barra said. GM's current family of global mid-sized cars, such as the Chevrolet Malibu, Buick Lacrosse and Opel Insignia share one architecture. GM used to use three different architectures globally for mid-sized cars. Consolidating to one mid-sized car platform reduced engineering and capital costs by 30 percent, she said. The company is also trying to use fewer engine models. GM has reduced its engine platforms to 16 from 20 in 2009. GM's target is 10 by 2018. GM further is more disciplined with product planning. The company had wasted $1 billion a year in engineering costs annually by starting and then shelving or delaying future models, Barra said. The company has already firmed up its product plan by approving core products in all regions, she said. GM can use the savings to add more new models or boost profits, Barra said. "We're not talking just a couple hundred million dollars," Bruce Clark, a New York-based analyst for Moody's Investors Service, said in an Oct. 28 phone interview. "We're talking about substantial savings over the long term. It's a very rich area to mine." The automaker has also cut the number of engineers assigned to internal processes and moved "a couple hundred" of them to vehicle programs, Barra said. She declined to provide a more specific figure and also didn't rule out future job cuts. Akerson is also looking to cut marketing costs. In April, he asked Global Chief Marketing Officer Joel Ewanick to review marketing strategy. Ewanick said in a telephone interview that he flew about 250,000 miles looking at GM's global marketing operations for ways to more efficiently market its brands. More than 50 agencies were doing creative work for Chevrolet, Ewanick said. GM looked at companies such as Apple Inc., Coca-Cola Co. and rival Ford. None had as many agencies working for them as Chevy, he said. Ewanick has started a review and has asked four major global agencies to give GM proposals on how the company would manage the Chevy account. The company wants to drop the number of agencies to fewer than 10, he said. While Chevy could go with one agency, Ewanick said that isn't likely. "We spent too much on production work, fees and bricks and mortar and not enough on marketing," Ewanick said. "Anybody of our size has already done this. Over a five-year period, it should enhance the bottom line. It's significant." The company is looking everywhere. In late October, GM sent a memo to its engineering staff saying they were lowering the thermostat to 66 degrees Fahrenheit (19 degrees Celsius) from 68 degrees at three engineering centers outside of Detroit to save $1 million a year. "A lot of the cost focus at GM is about discipline," said Jim Hall, principal of 2953 Analytics Inc., a consulting firm in suburban Detroit. "The company has to make a statement to employees. If you don't, then corporate entropy will creep back in."